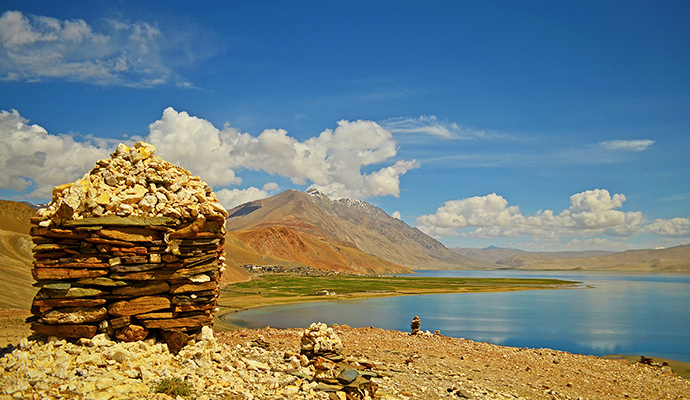 Home > BIKE RIDES > Which Ladakh Bike Trip Itinerary Suits You Best? There are a lot of Leh Ladakh bike trips to choose from! But which Ladakh Bike Trip Itinerary is best for me? A question bikers ask themselves when planning their bike trip to Leh Ladakh. The ultimate terrain bike riding dream for many. To live this dream, riders have a choice of many choices. The riding routes vary in duration, difficulty, accessibility and price. This number is not surprising for Leh- Ladakh considering the diversity of the region. The more you see the better it is. This is one of the most important things which actually affect which itinerary and biking trip package would best suit you. Get leaves from office is not easy and many of us actually have to spend a day or two arriving at the start point of the trip. Shortest Ladakh bike trips are ones that start and end in Leh and are typically 5-7 day trips. You can directly fly to Leh and finish the whole trip in 7-9 days depending upon where you are located. You get to experience the thrill of a Ladakh Motorcycle trip, ride over world’s highest motorable pass, see the best of what Ladakh has to offer and all this with-in a week’s time. Also accommodation options include luxury stays at every halt on this trip. Average distance travelled every day is also quite less and this bike trip is also suggested for those who do not have too much of biking experience and are less on confidence. Cost of just the bike trip is also least of all the options. Another interesting option for those wanting to do Manali-Leh biking adventure but do not have enough time is to do it on side only. You can start the bike trip in Manali, reach Leh, cover whole of Ladakh tour and end the trip at Leh itself. You can fly back from Leh and this way save at least 3 days. This is the ideal Ladakh bike trip. Not only you see all of the best Ladakh attractions but you also cover Himachal and Kashmir. This road trip can be started in Delhi/Manali and end in Srinagar/Delhi or vice versa. Minimum number of days required for Manali-Srinagar would about 11 days. If you want to come all the way back to Delhi then about 14 or 15 Days. Apart from above most common Ladakh bike trip itineraries, now many trips cover some of the newer offbeat places in Ladakh. These places include Hanle, Chushul and Turtuk. Every now and then a new mountain pass is claimed as the highest motorable pass in the world and these also get included in some of the itineraries. Reality is these passes are highest in India; honor of actually world’s highest pass probably rests with one in Tibet. These trips take you to some less known places but come with few risks. Mostly the average daily driving distance is higher and also there may be some permit related issues. The cost of the Ladakh bike trip depends on many factors, duration of the trip being primary of them. The actual cheapest Ladakh bike trip are the ones that start and end in Leh, but you probably have to fly into Leh which means cost of flights gets added. Mind you Ladakh flight fares are highest between June and September. Also trips that start or end in Srinagar are one of the costliest as not only length of trip increases but also the logistics involved. If you are taking your own bike, you do save on bike rent but actual saving would depend on if you need to transport your bike to Delhi/Manali or Srinagar from other parts of India. If that is the case you might actually end up paying more. For Manali-Leh-Manali, going for rented bike is actually a better option. But doing this trip on your own bike is another feeling altogether. This comes down to cost of the bike rent in the package. You can end up saving about 30% of the trip cost by taking a pillion along. On the down side riding on those long stretches for the pillion in the back seat is not that comfortable. For the rider handling the bike become slightly more challenging. We recommend opting for 500cc bike if there is going to be 2 people on the bike. The road is accessible during the months of June, July, August and September for most parts. These 4 months is also the popular season amongst travelers. Some may venture out during others months as well but the probability of road trips are thin. Weather conditions are not very conducive for a bike expedition. Many of the high altitude motorable passes close done for winters. Deciding on one route is the tough decision to make and it’s understandable. 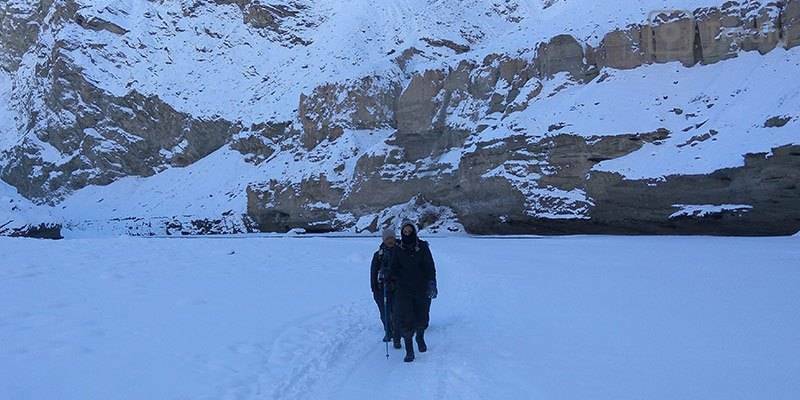 But by the end of this post, you will be able to make an informed decision on which Leh Ladakh Bike Tour is best for you. Find Ladakh bike tour 2018 images at the end of the post. Khardung La – Nubra valley & Pangong ride starts from Leh and passes through Khardung La pass to reach Nubra valley. We check out from Nubra camps and ride to Pangong lake on Day 2. On the third day, we ride all the way back to Leh from Pangong Lake campsite. Arrive in Leh a day early and check in to a hotel. We recommend a day early so that you have time to acclimatise. Rest is important to avoid mountain sickness. In this Leh to Leh Bike Ride (Khardung La – Nubra – Pangong)we begin our journey from Leh to Sham Valley on Day 2. This stretch passes though beautiful landscape and drive is easy. The next day, we reach the Nubra Valley crossing over Khardungla pass. After breakfast in morning on Day 4, we ride to most amazing Ladakh destination. The camping sites will be beside the serene Pangong Lake. After Pangong lake, we head back to Leh. Starting Bike Ride from Srinagar to Leh to Manali, we reach Leh on Day 3 of the ride. On day-1 we cross the infamous Zojila pass on our route. From Leh, we ride to Nubra Valley via Khardung La pass. From Nubra valley, we head to Pangong Lake and camp overnight near the lake. Once we get back to Leh, we start our journey to Manali via Sarchu. Upon reaching Leh, you can spend a day there for sightseeing and take time to acclimatize. We may visit Shanti stupa, Magnetic hill and Pathar Sahib Gurudwara during the local sightseeing. Day 2: Srinagar – Kargil (9-10 hrs ride). Day 3: Kargil – Leh (7-8 hrs ride). Day 5: Leh – Kardungla Pass – Nubra Valley (4-6 hrs ride). Day 6: Nubra Valley – Pangong Lake (8-10 hrs ride). Day 7: Pangong Lake – Leh (6-7 hrs ride). Day 8: Leh to Sarchu (8-10 hrs ride). Day 9: Sarchu to Manali (8-10 hrs ride). Day 10: Checkout from Manali – Trip End. 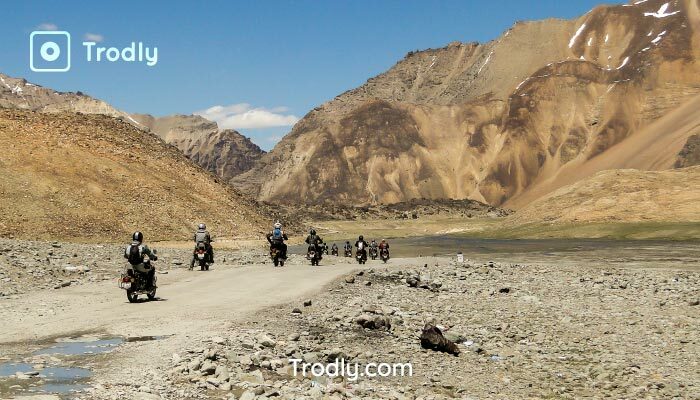 Manali to Manali (Khardung La – Nubra – Pangong Tso) ride starts from Manali. Rohtang Pass, Pangong Tso Lake, Indus-Shyok Rivers, Nubra Valley and Khardungla Pass we will witness them all. We will be crossing the high altitude passes and the notorious water streams on our way. This ride is going to be a test for your bike handling skills. Once in Leh, enjoy the beauty of the landscape and gorgeous starry nights which the region is famous for. Visit the famous monastery near Leh. The first day in our itinerary is kept for acclimatization and for the ride briefing. Starting from Manali in Manali to Srinagar Bike Ride, we reach Leh on Day 4 of the ride. We cover Jispa, Sarchu, Nubra valley, Kargil and Pangong lake. On Day-9, we ride to Kargil, along the Indus River, passing famous Lamayuru monastery and the moon like landscape. On day 10 day we reach Sonmarg and end the bike tour at Srinagar. Final morning you can take flight from Srinagar or proceed to onward journey. In this trip as well, Day 1 in our itinerary is kept for acclimatization. The main attraction of Manali to Manali (Nubra – Pangong and Tso Moriri) itinerary is the Tso Moriri lake. This lesser know lake is the largest of the high altitude lakes in the Himalayan region. It has some gorgeous views to offer. Upon reaching Leh, we spend a day there to rest and acclimatise. Mother Of All Leh – Ladakh Bike Trips is probably one of the longest and toughest bike trips in Leh-Ladakh region. But it’s 100 percent worth the hard work. This 14-day ride starting from Manali goes through Leh, Hemis, Hunder, Turtuk and Hanle on the Tibet border. 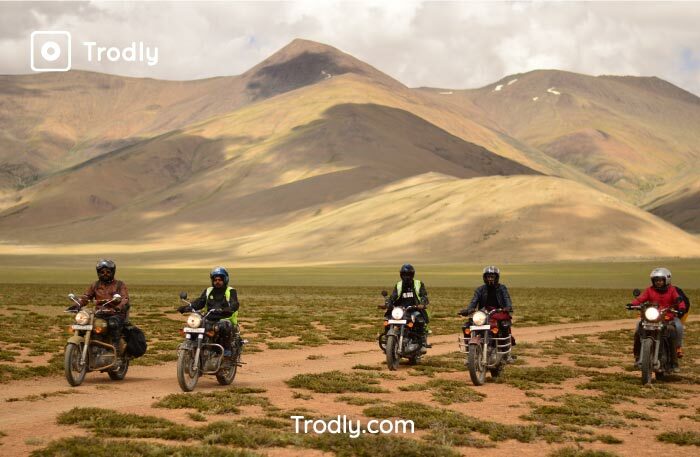 After that, we ride back to Manali via Tsomoriri, Tsokar, Pang, Baralacha La and Sarchu. 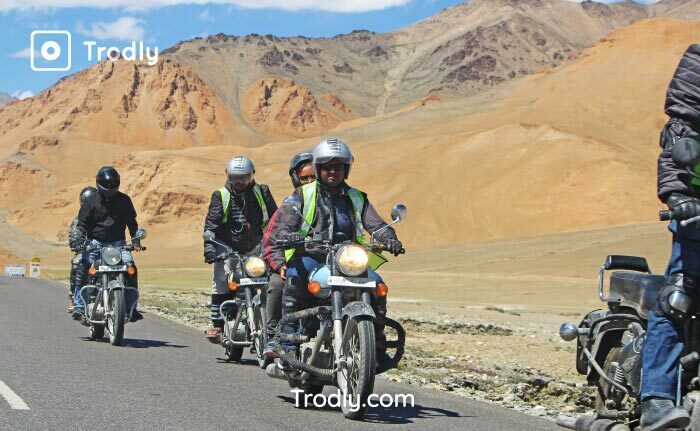 You also have a chance to ride near the Tibet border (Pangong-Tso Moriri route). The views of the mighty Himalayas are breathtaking. If time permits, we’ll visit ancient Buddhist monasteries. Witness high altitude lakes and Himalayan wildlife on the way. The climate is unpredictable and can be harsh. We will also ride across snow-covered mountain passes and high altitude deserts. This itinerary is planned to give you ample time for resting and to acclimatise. Day 1: Arrival in Manali – Test ride bikes. Day 2: Manali to Sarchu over Rohtang Pass – Tandi – Jispa – Baralacha La (4890 m), Nakee La, Lachulung La – Deepaktaal – Surajtaal (226 km | 8 hrs). Day 3: Sarchu – Moore plains – Tanglang La – Karu – Hemis – Leh (267 km| 7-8 hrs). Day 4: Rest Day in Leh and sightseeing in and around Leh. Day 5: Leh – Diskit – Turtuk (205 km) 6-7 hrs – Hunder (90 km | 3 hrs). Day 6: Turtuk – Hunder – Warshi – Panamik (228 km | 7-8 hrs). Day 7: Panamik – Shyok – Durbuk – Tangste – Lukung – Spangmik (Pangong Tso) (187 km | 6 hrs). Day 8: Rest day along Pangong Tso. Day 9: Pangong – Chushul – Hanle (314 km | 7-8 hrs). Day 11: Hanle – Salsal La – Karzok (Tso moriri) (150 kms | 5-6 hrs). Day 12: Tso Moriri Tso – Sarchu (228 km | 6-7 hrs). Day 13: Sarchu – Jispa – Manali (223 km | 6-8 hrs). Day 14: Explore Manali, Paraglide and Zip lining – Departure. Which Leh Ladakh Bike Trip is your pick? The cold deserts, vast valleys, orchards, extremely high mountain passes, camping beside the serene blue lake. Choose any of these itineraries and enjoy the ride of a lifetime. Leh Ladakh bike trip cost varies on various factors primary being number of days, quality of stays and itinerary. 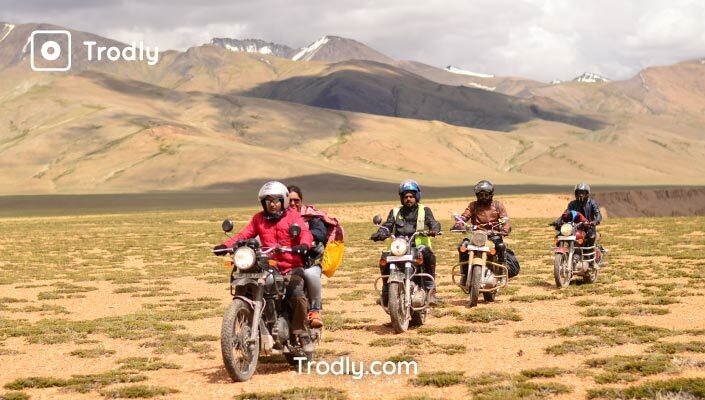 To keep the costs low you can either start from Leh itself and cover most of the Ladakh attractions or if you have made up your mind for Manali – Leh then start your bike trip from Manali. All the best and ride safe! Now that you know which Leh Ladakh Bike Tour is best for you, read our The Ultimate Guide to a Ladakh Trip to start planning it.